We recently announced an exciting new partnership with the new kids on the craft block Hazel & Ruby. They asked us, along with other talented craft bloggers to develop simple DIY projects for their new craft kit line Crafternoon. Exclusive to JoAnn’s stores, the brief was to create a craft project that can be made by anyone no matter their skill level, in one afternoon – now that’s my kind of brief. You can find out more about the kit line in the video below. Also make sure you enter to win your own kit of Holiday Paper Trees. The Raffle runs through Sunday. 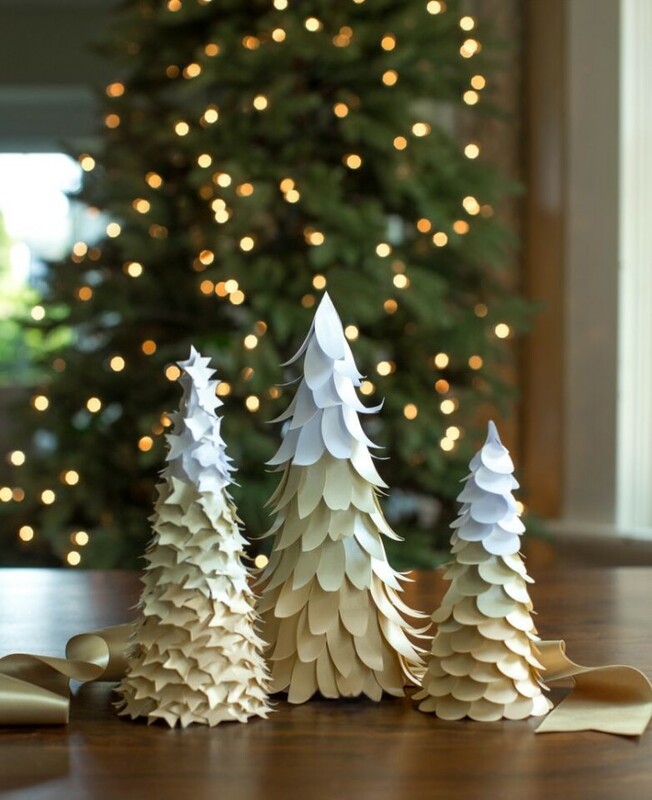 With the Holiday season approaching, we wanted to share our ultra glam DIY paper tree cones. In each DIY kit you will find a recipe card with photo directions, three sets of paper circles, stars and leaves and three paper cone forms – that’s everything you need to create these beautiful gold ombre paper trees for the Holiday season! Watch my video tutorial below to discover how to put them together. I have made so many versions of these trees over the years. Although I have to admit I’ve never thought of making an ombre toned one – maybe this year. Congratulations on the collaboration with Hazel&Ruby. These are sooo sweet! Great kit idea! I ordered these on-line from Joann Fabric and Crafts Stores and am looking forward to receiving them! I even got 20% off with their Veteran’s Day sale code. Can’t wait to get them! Thanks for another lovely project, Lia! These trees are so cute! I want to try them they don’t look that hard. I made trees last year making the flowers out of a paper swirl and it took forever to cut out enough for 1 tree so it will be nice to make some that have the papers cut out already. Super creative idea! We loved being able to make a kit that would be easy for anyone to try! Certainly more simple than hand-cutting everything 😉 We hope you enjoy! Oh no! I saw these and was looking forward to making them. I live in the UK and have just realised this is a kit which isn’t available here! Disappointment! So happy you are so interested in making them!! I hope you enjoy them! Thank you, Lia. I love your designs and look forward to them in my inbox everyday. It would be fun to have a whole forest of these cuties. Love them-they would look gorgeous on my mantle. They’re trendy and nostalgic at the same time. They are perfect for a snowy Christmas scene on a mantle!! So glad that you’re thinking of using them for the holidays 🙂 The design is trendy but the colors are classic. We were very pleased with how these turned out! CONGRATULATIONS on having your idea transformed in to a kit that will bring FUN & CREATIVE HANDMADE times to families!!! PS – I use a liquid glue called Helmar 450 Quick Dry, which is just like using a hot glue gun but without the hot, so I know it will be perfect for all the little hands (and not so little) hands to use to make your beautiful trees. I will have to make these, too cute and so perfect for snow scene on any table. Have already made some trees in different shades of aqua with one dimensional trees included from a BHG craft magazine. Love those as they’re made to be done with all levels of abilities. Been making little rein deer also. I remember a crafternoon in BHG I think, year or so ago, I even tore pages out of zine to keep, Does this have anything to do with that crafternoon where several young women got together to craft the day away? Even if this crafternoon has nothing to do with that one these kits will be wonderful for so many people that want to make something for gifts or their homes. I will have to figure out how to make the stars, circles and petals for each tree on my own but think it won’t be too hard to figure out. Maybe even be able to use punches for shapes to put on trees. How exciting that your blog was invited to participate in this. I’ll be headed to JoAnn’s to buy kit for trees anyway. This will be so fun making, think will get my grand daughter over here to work with me. That’s if I can get her away from her new boyfriend. She’s 15 and this is her first actual boy friend. Was so excited myself to see this project on blog today. I”ve been working on the little house ornaments. Found some two sided pearlish metallic lighter card stock at Walmart in pkg. so bought one to see how they do, not too easy to handcut all the windows in little houses but will keep trying to keep them neat looking. Might put some vellum across backs of windows.
. It’s going to kill me not to be able to craft after my surgery, Maybe I could figure out how to use my toes? lol. Happy daze gang. We were so excited to participate in this, we are glad that you like it!!! They really are perfect for a snowy Christmas scene 🙂 The reindeer will be a perfect addition! For the paper house ornaments- have you tried using an x-acto blade? That might be easier for the little windows. And adding vellum would make for some adorable curtains! Those trees are so pretty & the tutorial was great. What a beautiful trio of ombre trees!!! I love the fact that everything is included and that this is easy enough for the kiddos to craft too!! TFS! I am so glad that you like it! We love making projects that are easy for the kids to do too 🙂 We will have a bunch more holiday kids’ crafts coming soon, so look out for that! in a kit, ready to make! Thank you for your sweet words, Carla! We so appreciate that you enjoy the project 🙂 ‘Tis the season! What a great idea for a kit. I love all of your designs. Congrats on the collaboration! I also wanted to let you know that at least for me, the image to pin on pinterest doesn’t show up/work. Thank you for your sweet words Traci!! Not sure what’s going on with Pinterest–it seems to work on our end, but you never know how it will show up for others. Hopefully everything will show up in the future!